Customised Training | Dew-Point International Ltd.
We strive to be your preferred choice for total organisation development, providing you with our experience and resources to develop skills, improve effectiveness, and change habits and attitudes. A Dew-Point provides customised in-house training programmes. 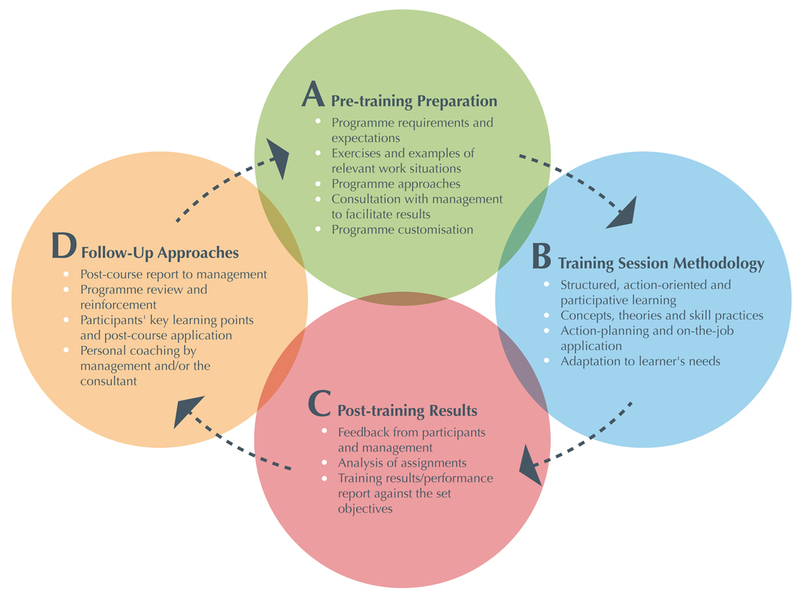 We use a consultative approach for each training engagement. B We begin with the objectives and requirements for the training from management, adding any insight gained from potential participants about their interests and needs. Using all the input given, we design the training programme, including activities, exercises, cases and materials. C During the programme, we balance the learning needs of participants by using adult learning techniques as well as fast-paced, flexible facilitation skills. D Our end goal with all training is to enable improved processes and higher levels of performance. We begin the process of learning application in the classroom, committing participants to continuing their progress and communicating their results with their managers.